Three phase rectifiers are commonly used in high power applications for their low cost and ease of operation. Rectifiers have non-linear characteristics and draw non sinusoidal input current from ac sources. This causes a number of problems in the power distribution networks. Increase in reactive power, low input power factor, input voltage distortion etc. are some of those problems. In this respect, switch mode regulated rectifiers offer efficient, compact and high efficiency operation. The improvement of input current is possible by addition of Buck, Boost, Buck-Boost or ?uk regulator with single or three phase rectifiers. Pulse width modulation (PWM) technique is used to control the switching devices of these regulators. 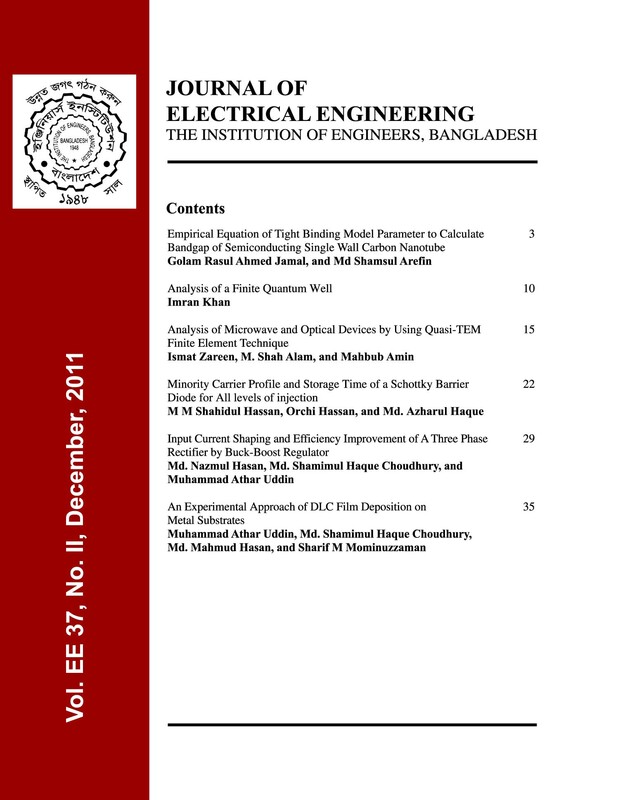 In this paper, a three phase full wave diode rectifier is analyzed with Buck-Boost regulator. The work shows, when a variable carrier frequency is applied for different duty cycle, the THD of the input current is low and the overall efficiency is more than 80% for lowest and highest output voltages. It provides the facility of control of output voltage to lower and greater than the input voltage efficiently by variation of duty cycle. Previously Buck regulated rectifiers were reported with good power factor and input current THD for constant voltage output. The work of this research will allow variable voltage.